Great Cities Institute has released the Calumet River Communities Planning Framework. Through a year-long process, GCI worked to develop a framework for future development in the community areas of South Chicago, South Deering, and East Side on the city’s Southeast Side. Historically the Calumet River has served as the primary location for industries relocating as the Chicago River changed its usage and industry mix. Industries like steel in the late 19th century and today businesses like metal recyclers have relocated to the Calumet River. The framework is intended to act as an information source for organizations or businesses looking to do work or development projects on the Southeast Side. The document establishes principles for development that are grounded in community feedback as identified throughout the planning process. Focusing on issues identified by the Southeast Side communities. The document is designed to supply residents and local organizations with data that can be used to organize campaigns to promote the quality of health in the community. In August 2016, the Metropolitan Planning Council (MPC) released the Our Great Rivers vision for the Chicago, Calumet, and Des Plaines rivers. The MPC document presented a vision to make Chicago’s rivers more inviting, productive, and living for the residents of the city. As a part of the Our Great Rivers project, the Chicago Community Trust announced in February 2017 funding for neighborhood projects that support the implementation of the Our Great Rivers vision. Recognizing the importance of the Calumet River and the Region, GCI saw the opportunity with the Our Great Rivers funding to bring together local community organizations to develop a strategy to address environmental and economic issues in the Calumet River communities. We appreciate the grant from the Chicago Community Trust that partially funded this document. 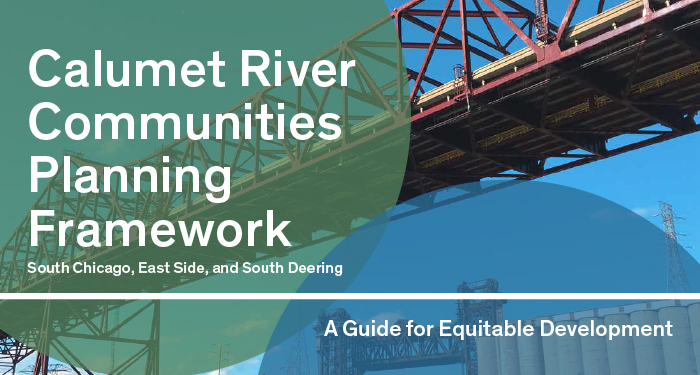 The full Calumet River Communities Planning Framework document can be accessed through the GCI website here.